In all the talk about Paul McCartney’s “Kisses on the Bottom” the well-known and popular jazz vocalist/pianist Diana Krall – who plays on every track – has very much taken a back seat. She has stayed quietly in the background. However, I think Krall plays a pivotal role in the success and the essential sound of the album – far more than she’s so far been given credit for. Diana Krall has been refining her own sound and style for nearly twenty years now, dating right back to her debut recording, “Stepping Out“. Over that time she has released ten jazz albums which, for all intents and purposes, mirror exactly the way Paul McCartney’s “Kisses on the Bottom” was put together – right down to the players and the studio in which many tracks were recorded. If you want proof you need look no further than her most recent studio recording from 2009 called “Quiet Nights“. Take, for example, track 2 from that album – the song “Too Marvelous for Words“. It’s a classic popular song from 1937 recorded hundreds of times over the years. The personnel on Krall’s version reads as follows: Diana Krall – vocals, piano; Anthony Wilson – guitar; John Clayton – bass; Jeff Hamilton – drums; Paulinho Da Costa – percussion; produced by Tommy LiPuma and Diana Krall; recorded and mixed by Al Schmidt and Steve Genewick; recording studio – Capitol Studios, Hollywood, California. 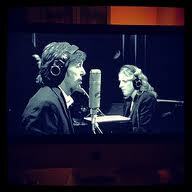 Now take track 5 from McCartney’s “Kisses on the Bottom”. The song is “The Glory of Love“, a classic popular song from 1936 recorded hundreds of times over the years. 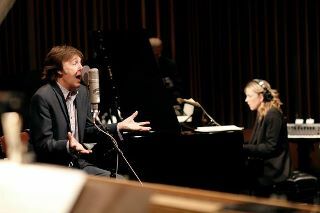 The personnel reads as follows: Paul McCartney – vocals; Diana Krall – piano and rhythm arrangement; Anthony Wilson – guitar; John Clayton – bass; Jeff Hamilton – drums; Mike Mainieri – vibraphone; produced by Tommy LiPuma; recorded and mixed by Al Schmidt and Steve Genewick; recording studio – Capitol Studios, Hollywood, California…..
Start to get the picture? No offense Paul. I don’t think you’ve done a Rod at all. I think you’ve done something far more clever, so more tasteful, sophisticated and stylish. I reckon you’ve done a Diana. For an insightful review of “Kisses on the Bottom” see RadioBrandon.blog’s thoughts. Got a lot of time for Brandon’s take on music. This entry was posted in Beatles, Beatles Music, Paul McCartney and tagged Beatles, Diana Krall, Kisses on the Bottom, Music, Paul McCartney, Tommy LiPuma by beatlesblogger. Bookmark the permalink. Un petit coucou de France. J’ai écouté avec attention le nouveau disque de Paul et je pense qu’à la première écoute ça n’est pas évident. Mais si l’on persiste, on est sous le charme et l’apport de Diana Krall est déterminant dans le succès de l’album. Je pense que Diana reste en “sessous” tout en apportant sa touche essentielle au disque. Je suis trés heureux que Paul ait pu réaliser cet hommage aux jazz.